– 5th International Meeting on Molecular Imaging and Molecular Therapy 5th Serbian Meeting on Hybrid Imaging and Molecular Therapy with International Participation, MARCH 2019. 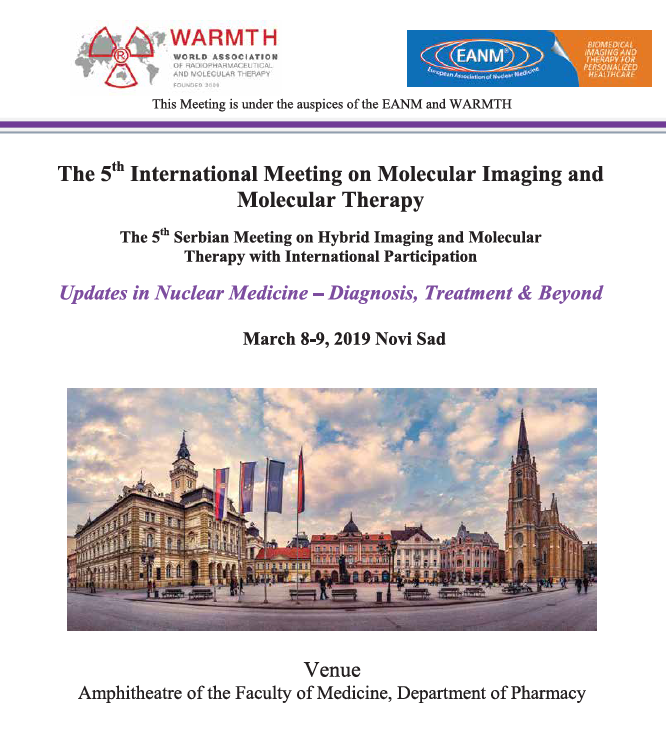 5th International Meeting on Molecular Imaging and Molecular Therapy 5th Serbian Meeting on Hybrid Imaging and Molecular Therapy with International Participation, MARCH 2019. 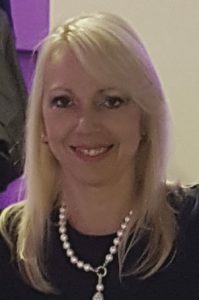 It is my great pleasure to welcome you in the city of Novi Sad for attending the 5th International Meeting on Molecular Imaging and Molecular Therapy and the 5th Serbian Symposium on Hybrid Imaging and Molecular Therapy with International Participation, under the name Diagnosis, Treatment & Beyond. The Meeting is organized by the Medical Faculty of Novi Sad and the Serbian Society of Nuclear Medicine, under the auspices of the EANM and WARMTH, but winning team has not been changed. Our previous meetings brought together nuclear medicine physicians, chemists, physicists, technologists and those interested in nuclear medicine science from many countries all over the world. We had over 300 participants from 20 different countries. Considering the fact that this is our 5th congress and that our team in now quite experienced in organizing events like this, you can expect even better and enriched scientific and cultural program that before. Nuclear medicine has changed over the recent years. It enables us to treat and scan the patients with new techniques and radiopharmaceuticals, improving compliance and effectiveness of treatment and improve patient clinical outcome. The scientific program of the conference has been designed to cover a wide range of nuclear imaging modalities and therapies.We hope it will be interesting to the experts of nuclear medicine, oncology, neurology, urology, cardiology and endocrinology. Additionally, this meeting is intriguing and challenging for young nuclear medicine specialists and residents. Different specialists are invited to evaluate and learn about the role of nuclear medicine theragnostics-imaging to diagnose and treat the disease and beyond. As the hosting city, city of Novi Sad has not been nicknamed the “Athens of Serbia” without a reason; its history as a vibrant, creative city continues nowadays through its recognized art galleries, rich musical events, and a vibe that is generally more liberal than that of other Serbian cities. Recently, Novi Sad has been designated with two prestigious titles: European Youth Capital for the year 2019 and European Capital of Culture for the year 2021. This meeting is a great opportunity for all of you to communicate with colleagues from different countries all over the world. I am sure it will result in creative exchange of ideas and future collaboration. We look forward to welcoming you in our beautiful city of Novi Sad. *The Symposium is under the auspices of the EANM and WARMTH. The program of the Symposium can be downloaded HERE. – Closing Dinner on Saturday. For all Symposium participants Technical Organizer PanaComp offers accommodation in some of the best hotels by reduced prices. All hotels are situated near the event venue. *Any extra charges for mini-bar, telephone, room service, etc. should be payed at the hotel directly.